How many individuals here have one of these either complete or in the works? This is mine as it sat when I picked it up. I'll post some new ones soon. Post upyour favortite shot of yours, even if it's panels are spread out in your lawn. Duke... You picked up the one that had been donated, right? Just exactly what did I miss out on? I nearly bought it, ya' know:lol: Thanks for the heads-up on this thread, BTW!! There are two pics... one in its present state and another when it's running. Mike, What are you doing under the hood? My refurbished tank comes back next week - Tank and a fuel pump is pretty much what it needed. Came with all the goods, Corbeau racing seats and harnesses, hardware, trim, carpet, rims, badges etc. etc. ...Course I've got to finish out the body too. I have a few ideas there. Problem is I have way too many projects right now a couple of antique motorcycles, old musclecars, old rovers, but the deal was too complete to pass up. Is there anyone else here besides Chelle and Speed who have these or are building one? (that includes Velo Rossas etc.) Doesn't Oz have one? I think I'll go with a fuel cell rather than refurb my tank. It leaves more room for exhaust. Mine is missing a bunch of Ferrari badges. If you have extras, I'll buy them. I wish I had the time and energy you apparently possess, Duke. I just haven't been the same for about ten years now. Mike u need some wheels to fill out those rear flares! You've got that right... correct Dayton spokes are in the near future!! Sorry no extra Badges - but plenty on ebay if you go that route. It's not so much energy as a an addiction...heh heh. 10 years? Hope all is okay. Car looks good. Keep it up. Some of those badges are pricey... $80-120 for a nose badge... $200-300 for cloisenne fender shields... SHEESH!! Yeah, everything's fine. I guess my body just fell apart suddenly in early '97. The docs can't figure it out. All's well. I feel your pain. I wonder if we have the same no name illness. Doc. says all tests look OK. I feel like I have Gulf War Syndrome except that I was never in the Gulf. Closest I was is north Africa. I have been dealing with it even longer than you. Do not get as much done as I did thats for sure. That's a tough go... Hopefully gets better. Isn't this Chelle's friends car? Spotted it on cardomain. I'll see if I can post a pic. I'm about a quarter way through the VR conversion. I live in Greenbrae, CA, near San Francisco. 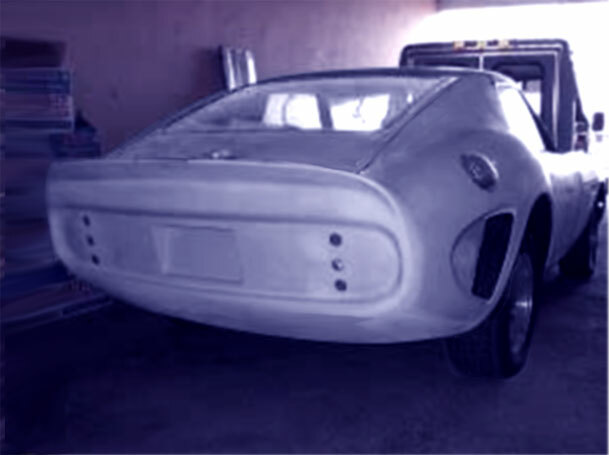 The car has a Chevy 350 with Holley Projection, Vortec Heads (around 400 HP). Toyota truck brakes in front and 240SX discs in back. mclark999... Sounds like a nice ride. Post those pics soon!! nope - not Kim's car, I saw that car on ebay some time back as well. Bought mine from John Washington. I believe it's still posted on his web site in the "For Sale" area (If ya wanna see some before pics). Have done a complete strip down and am in the rebuild process. Just got it back from the paint shop !!! It's so shiny. Like a new 'black penny'. GIVEN: Alpha 1 mostly original except engine and transmission. QUESTION: Regarding future vehicle value... Are there any mods which will DECREASE future value of this car? I'm wanting to do many upgrades, some of which are more difficult to undue, i.e. frame reinforcment, fuel cell, etc. I have posted the latest photo of my GTO in the photo album. It's there just to make everyone else feel good. I haven't really been that slack, I've put together a 100+ page project manual showing all the proposed work. 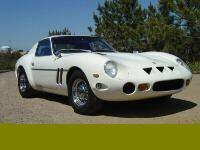 I have now got an 'in principle' agreement from an authorising engineer that the car can be registered when the work is finished - 250GTO kit, Gen 111 (LSX), T56, r230 & Arizona Z brakes. The project manual is actually 22 MS Word files and includes numerous photos and task description from Hybrid Z, but all set out in an easy-to-read printable format. If any GTO folk are interested I can e-mail the files - just let me know an e-mail address. You can print a copy and watch your friends start to salivate! I'd like to get a look at that manual. If you send me a PM I'll leave you my e-mail address. The Goat ran last week for the first time, refurbished tank, new fuel pump blah blah blah and assorted expensive bits. Sounds awesome through the headers though. Lots of work ahead. Does anyone think I'll go to hell if I go with side pipes on my GTO? ...Think I've located a v12 with Webers for the GTO. Photos on sunday. I'll run the 6 for at least a year while I collect parts and plan the swap. It'll be a bit of a shame now that I've drop all this coin on getting it to run so well. DUKE... How much $$$ are you having to pay??? Boy from Oz... I'm not afraid of burning in hell but I worry about where you might put those side pipes after you yank them from my car.